The letter R inspired twenty-six resourceful Indian flavors! First, the R vegetables. Let's start with a vegetable that generally comes in two shades: radiant white and rosy red or pink. With its pungent taste and sharp aroma, you can't miss the Radish! TC of The Cooker uses the beautiful little Red Radishes and blends them with another R food, Red Rice, to create her own unique Radish and Red Rice Pulao. Asha of Aroma/Foodie's Hope shreds a gorgeous snow-white Radish, also known as daikon, and blends it with flour and a selection of spices to roll out some tasty Radish Masala Parathas. Also check the post for a delicious radish chutney recipe. Neelam of Recipe Factory also uses the large Radish as a stuffing for a tasty breakfast of Radish Parathas. The next vegetable is the ravishing Red Bell Pepper, a sure-fire way to add a gentle sweetness and an explosion of color to any stir-fry. Sreelu of Sreelu's Tasty Travels pairs this colorful vegetable with some mild milky paneer and cooks them into a gorgeous Red Bell Pepper and Paneer Sabji. Then there is the ruby-red Red Cabbage, with its perfect petals, crisp and tasty. Sajeda of Chachi's Kitchen uses the red cabbage in a beautifully simple way- Red Cabbage and Chilli Sambhoro is a traditional Gujarati side-dish. Then comes a vegetable painted a verdant, refreshing green, the Ridged Gourd. The ridged gourd hides its juicy, melt-in-the-mouth interior under a thick fibrous outer covering. A Cook of Live To Cook cooks the ridged gourd with dal and spices to make a tasty and nourishing Tamilian Ridged Gourd Stew or koottu. The royal purple eggplant is called Ringan in Gujarati. Trupti of The Spice Who Loved Me uses the eggplant in an appetizing dish that comes from the Kathiawadi region, and is rustic and unpretentious in its preparation: Ringan No Ohloh or smoked eggplant. Manasi of A Cook At Heart makes an unusual and perfectly tempting Ringan Curry, combining eggplant with tomatoes and some fresh fenugreek. The ruddy sweet potato is called Ratala in Marathi. We have two recipes with this nutritious, delicately sweet tuber. First, a creative twist on a crowd-pleaser. Bee and Jai of Jugalbandi take the Maharashtrian breakfast favorite, the poha, and use sweet potatoes to give it a splash of color and a nutritional boost with their unique version: Ratalyache Pohe. Tee of Bhaatukli combines shredded sweet potato with some powdered peanuts to make a quick stir-fry that is traditionally made on "fasting" days. I have to say: there is nothing austere about this vibrant and delectable Ratalyacha Kees. Dhana of Fresh Kitchen discusses many ways to eat this nutritious and versatile vegetable, and then goes on to make one of her favorite comfort foods: Ratalyacha Khees. Then comes an R fruit, the Raw Mango. While the ripe mango is wonderful to eat as a fruit or incorporate into creamy desserts and smoothies, the raw mango is used extensively as a vegetable/ accompaniment in everyday cooking. Priyanka of Lajawaab combines the flavor and nutrition of spinach with the tangy taste of raw mango in her own creation: Raw Mango and Spinach Vegetable. Mandira of Ahaar uses her stash of canned kidney beans in combination with some vegetables, rice, nuts and raisins to make a festive Rajma Pulao that can turn a routine dinner into a special event. Suma of Veggie Platter combines kidney beans with potato and dishes out this Rajma Aloo, a quick and easy curry that would be pair deliciously with breads like rotis and puris. Mahek of Love 4 Cooking discovers taco shells, and uses them creatively in an colorful and tempting Indian-Mexican fusion dish: Rajma Tacos! The first rava dish is Rava Rotti where a thick batter of rava, onion and spices is patted onto a hot skillet and roasted to perfection. We have two versions of this specialty from Southern India. Latha of Masala Magic gets to eat a Rava Rotti made with rava combined with onions and some spicy seasoning, with a touch of her Mom's love! Vani of Mysoorean shares her mom-in-law's Konkani version of Rava Rotti, with a touch of coconut to make the batter even richer. Traditional idlis are steamed cakes made with fermented batter that is a couple of days in the making. But what if you are in the mood for instant gratification? Rava Idli comes to the rescue! Usha of Samaikalam Vanga shares her recipe for Rava Idli where you simply mix up the batter and steam some fresh idlis in minutes. G V Barve of Add Flavour also has a recipe for Rawa Idli- this time, from a popular cookbook. Next comes a R cereal that may not be well-known in more prosperous nations, but has sustained many drought-prone lands over the centuries: Ragi or finger millet. Ramya of Mane Adige celebrates this cereal with an aptly humble and down-to-earth preparation, boiling ragi batter into little dumplings called Raagi Mudde, which go well with any vegetable curry. Linda of Out Of The Garden roasts some eggplant to bring out all its juicy deep flavors, then combines it with dal to create this flavorful and unique Roasted Eggplant Sambar. Sukanya of Hot 'n Sweet Bowl uses a combination of vegetables and brings them together with cheese to make a succulent platter of Roasted Vegetables. Richa of As Dear As Salt recounts a memorable meal of Ragda Patties made by a generous mom for a houseful of unexpected little guests. Aarti of Aarti's Corner thinks back to nostalgic times of eating chaat in all the best places in the city of Pune and goes on to recreate her beloved Ragda Pattice. Let's end this round-up with a sip of two restorative beverages, one is hot and spicy and the other is cool and sweet, but both are tangy and delightful! Rasam is a thin lentil soup, and an integral part of traditional meals in many parts of Southern India. Sharmi of Neivedyam shares a tangy lemon Rasam as part of a spectacular (and I mean *spectacular*) Andhra feast. Finally, Aarti of Arti's Corner decides to face the sweltering summer with a tall glass of Refreshing Kairi Panha. In the world of vegetables, there are the over-achievers and the underdogs. With their gnarly, knobby appearance, the root vegetables are a rather unglamorous lot, and are generally inexpensive and easily procured. But their importance in Indian cuisine cannot be overstated. Root vegetables are generally a means used by the plant to store energy, but they are a very diverse lot, both botanically, and in a culinary sense. In my kitchen, no matter what other ingredients may be present or absent, four root vegetables are always around, ready to be rustled up into a quick dish: potato, onion, garlic and ginger. Of course, a spice found in every Indian kitchen- turmeric- is also ground from a dried root. Onion, ginger and garlic, in different combinations, are three of the most common flavoring agents of many savory Indian dishes. Not that they are indispensable, though: Traditionally, the Jain community of India eschews garlic and onion in their food, and while many people cannot dream of preparing meals without these two ingredients, the Jains have evolved a delicious cuisine that is perfectly flavorful in the absence of garlic and onion. Creative cooks can make delicious food no matter what constraints they are operating under! Other root vegetables have beautiful colors and are versatile and nutritious: sweet potatoes, radishes, carrots and beets are all used in dozens of ways and lend themselves to a lot of creativity. Carbohydrate-rich root vegetables often sustain human life in the more arid and harsh parts of our planet- the yam and cassava and taro to name a few. No matter how many root vegetables I try, there will always be new ones to taste: I have yet to play around with sunchokes and jicama, the rutabaga and celeriac and dozens of other mysterious roots! I have only recently started giving root vegetables the attention they deserve and trying out new recipes with them. A couple of years ago, radishes would never be found in my shopping bag. Inspired by fellow bloggers, now, radish pachadi and radish sambar can be found on my table on a weekly basis. Today, I am using my new friend, the radish, in a paratha. Mooli paratha is an iconic dish in Punjab, but this is the first time I am making it. I used a new technique for rolling out the parathas, sandwiching the stuffing between two layers of dough. This I learnt from Musical's blog, which is my classroom for learning about true Punjabi home cooking. 1. Place all dough ingredients, except water, in the bowl of a food processor fitted with the dough blade. Start processing, then drizzle in warm water through the feed tube until the dough comes together in a firm and elastic ball. Remove into a bowl, knead briefly, then cover with a damp kitchen towel and leave for 30-60 minutes. 2. Prepare the stuffing by mixing all the ingredients together and setting aside for 10 minutes, then squeezing out the excess water. 3. To make the parathas, knead the dough again for a minute, then divide into 16 equal small balls. Roll 2 balls into thin, even circles. Spread 1/2 tbsp or so of stuffing all over one of the circles, then cover with the other circle and seal the edges by pressing down with the rolling pin. Cook the parathas on a hot griddle, adding a few drops of olive oil on each side as required. The parathas are ready! V made some Tomato-Onion Koshimbir to go with the Radish Paratha: Finely diced tomatoes and onions combined with yogurt, peanut powder, cilantro and salt to taste. A pinch of sugar is a good idea if the yogurt happens to be too tangy. Of course, in my eyes, no paratha meal is complete without a side of one's favorite pickle! How do you serve this paratha? Paratha makes for a very satisfying breakfast, brunch or lunch. 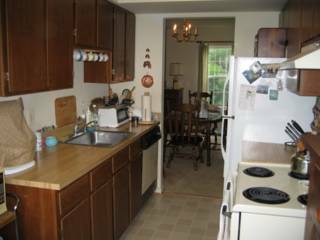 They can be stored in the fridge and reheated on a hot griddle or in the toaster oven with good results. The verdict: The overall taste was superb, but the parathas were slightly doughy...because I was not quite able to roll them out thinly enough and the circles of atta were a bit thicker than they should have been. This is going to need some practice! But I love the whole idea of eating a salad inside a paratha, and this one I will make again and again. Dessert: Sweet Potato Payasam from Coconut Chutney. Great round up,good collection of Mooli recipes to try.Hurray! Great variety of R food. never realized that there could be so many different dishes inspired by the word R. Mooli paratha was good. I prepare them but by mixing grated mooli into the atta (other spices same as urs). This way they are easy to roll and also you can see shreds of radish on the surface. You can also make store this atta in fridge for few days, and roll them in parathas when short of time. Hey Nupur! 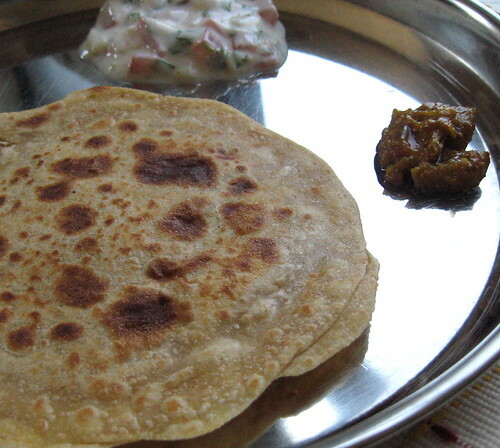 what a 'Ravishing Round-up ' your Radish Parathas make me Ravenously hungry! Well, you pretty much covered it all - a great 'Reportoire ' of R dioshes! may i add to this wonderful list the cool summer dish 'Raita' made with cucumbers and other vegetables ? what about Rava dosai , a breakfast delight ? enjoy the long weekend ! nupur, this is a great recipe. you can even use the radish leaves in dal, or mince it and add it to the paratha dough. they have a peppery flavour. Yummy looking paratha's. thanks for the roundup. It's amazing to see so many creations and variations !!! Nupur, that is an interesting menu there featuring only Root veggies. On the radish paranthas, try to make the stuffing as 'dry' as possible, so get as much moisture out of the mooli as possible. And when rolling use a lot of dry flour because, no matter what, the stuffing will still be 'wet'. I roll it as thin as I want and then slide a knife to free it where ever it may still be sticking - the only way to remove them from the pol-paat if you like the paranthas thin! Try it and see if it works for you! Oh my - so many yummy sounding dishes, not least of which is your own Paratha. Once again, I am truly inspired by the fantasitc variety and anxious to try quite a few! Once again, so many good ideas! I've never heard of radish paratha, but I'm eager to try it. Thank you! Raakhee, I'm totally going to try your method next time. Thanks for all the tips! Bee, you know, I can never find fresh and healthy looking radish leaves :( I'd love to use them, but the ones I find are usually too ragged or limp looking. Must go in search of fresher radishes! Sreelu, yes, the variety of dishes in the round-up always delights me! Thanks for participating! I'm definitely going to try it the way you describe...thanks for taking the time to give me all those tips! 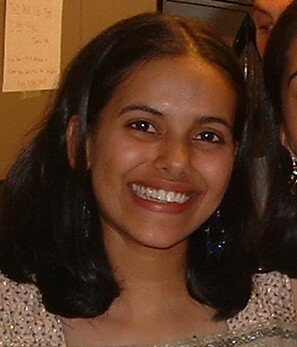 Sunita, would love it if you got a chance to participate :) but thanks for being a supporter meanwhile! 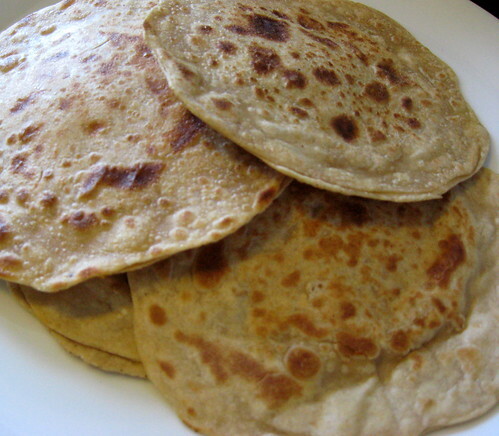 my Mom used to make great muli ka parathas!! miss her and the food she makes too. you brought back good old memories. thanks a lot for your lovely words and the round up. Another informative round-up Nupur and I enjoyed your column again on the Dining Hall. I have to catch up with recording the entries you have here for R.
Just a small tip: To make the raddish stuffing- you should first add the salt - let it sit and squeeze the water. Then add the masalas...that way the smell is taken care of and you don't lose any of the good taste from the masalas!! The dough for parathas should be a little less soft than poori/chapati dough! hey nupur, a really nice roundup of varied dishes. i loved ur blog on the dining hall. being a new blogger , it provided a good insight about how i should proceed. keep up the good work. cheers!!! Lovely round-up, Nupur! Love your mooli paratha. My mommakes it the same way- with 2 rotis and stuffing between them. Your fried potato looks yum! Beautifully presented.